In 1777, the revolutionary war was in full swing. British forces were attacking and burning American forts and cities to the ground. In New York state, Colonel Ludginton, a decorated veteran from the French and Indian War, had volunteered to lead the local militia. On April 26 of 1777 a messenger arrived at the Colonel’s door with word that the British were burning the town of Danbury, Connecticut. The Patriot army had just transferred food, medicine, gunpowder and shoes to Danbury to be closer to the New York border. Without those crucial supplies, the Patriots would be crippled in their resistance. Colonel Ludington ordered the messenger to ride on to warn the troops. The messenger refused the order citing exhaustion. Prohibited from leaving his post, the Colonel realized the city might fall. Someone had to warn the militia. Realizing the gravity of the situation, 16 year old Sybil slipped down to the stables. It was a dark night and hard to see as she saddled up her horse, Star. She grabbed the closest thing to the stable for a weapon, a long stick, and flung herself onto her steed. As she rode from the barn it began to rain. Within moments she was soaked to the skin. Avoiding outlaws, Indians, British and wild animals, she rode from 9 p.m. until dawn gathering up over 400 men to ride against the British invasion of Danbury. 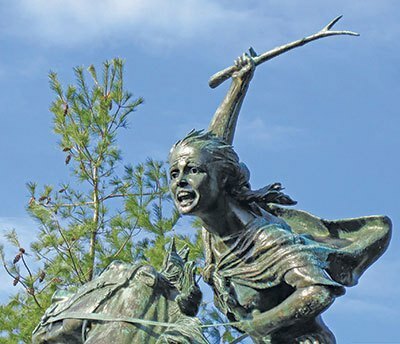 Today there is a statue of this girl near her hometown of Fredericksburg, New York (later renamed Ludingtonville in her honor) among a few others. She was commemorated in 1976 by the U.S. Post Office with a stamp bearing her image and yet still she remains relatively unknown. Perhaps someone should write a poem about her. Brave Magazine is published and paid for by FlagandBanner.com and our advertisers. It is FREE to FlagandBanner.com customers. Currently the magazine publishes twice a year in May and October. We'd love to hear from you! Comments, questions, information, advertising, subscriptions or to share your Brave story with us!